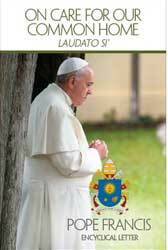 Looking for more from Pope Francis, but too busy to read an entire papal encyclical in one sitting?! Want an easy way to set up Laudato Si' as a source for daily inspiration and meditation? If you have not already done so or if you would like to help spread the word, simply click here to subscribe (and look for a confirmation code to complete the process).